My Broccoli and Raisin Pasta Salad is a quick and easy dish perfect for picnics, packed lunches and light dinners. Best eaten al fresco with a glass of white wine! What on earth has happened to the weather?! I know, its incredibly British to start talking about the weather, but seriously what has happened?! One minute we were in the throws of a heatwave with cool cocktails and ice creams the order of the day. As I look out of my window now all I see is a sheet of grey. The rain does not stop falling. Still, I’m hopeful its just a blip and behind the rolling grey clouds that there is a sky of blue waiting for its moment to shine. Until then, I’ll be sharing all the summer recipes I can in the hope that it will bring the sun out from it’s hiding place! 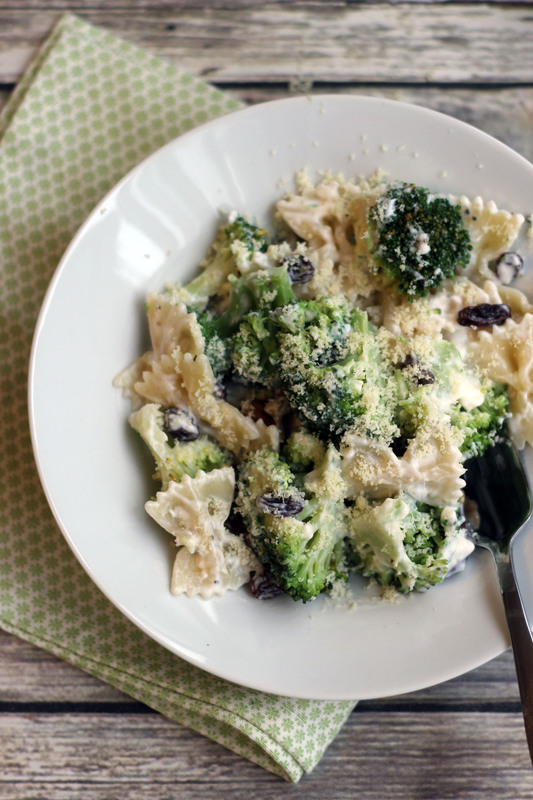 This Broccoli and Raisin Pasta Salad came about because Jon was craving pasta. Like seriously craving pasta… Every dinner time he kept trying to sneak pasta into the dish. He ever suggested we served curry with dinner one night so I knew I had to give in. I have nothing against pasta and I certainly don’t think you should ever cut out a whole food group. Carbs are my friend, and I am a huge pasta fan. But no-one needs white pasta. Who am I kidding…it definitely tastes good. To counteract the rather nutritionally bland pasta, I topped it with a creamy dressing made with lemon, pepper, yogurt and mayonnaise before stirring through steamed broccoli, plump juicy raisins and a handful of crunchy nuts. Broccoli and Raisin Pasta Salad is a simple dish with relatively few ingredients but its tastes great and is easy to throw into a tupperware for taking to the beach or a picnic in the park – what more do you want in a summer salad?! 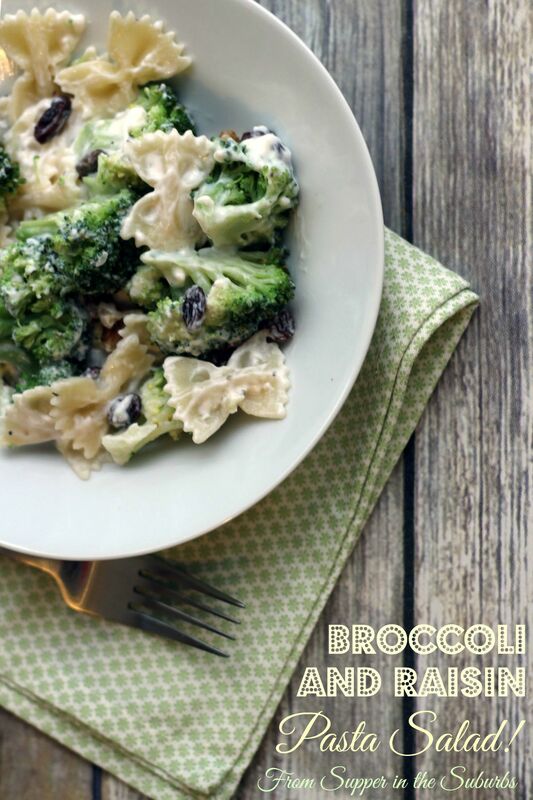 Steam the broccoli florrets over the pasta water for 5-8 minutes until bright green and tender. Place to one side to cool while the pasta finishes cooking. Remove the pasta from the heat once cooked, drain, then run under cold water until pasta is completely cool. 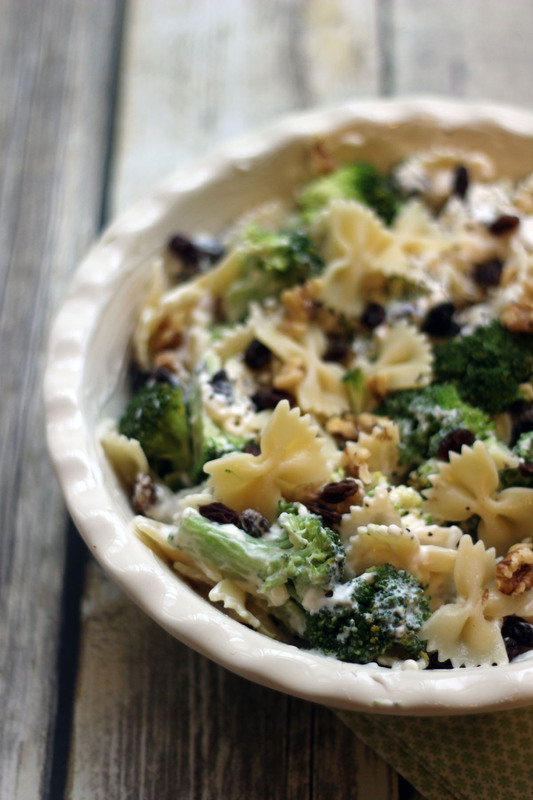 Transfer the pasta and cooled broccoli to a bowl and add the yogurt, mayonnaise, lemon juice, onion and raisins. Stir thoroughly until all of the ingredients are combined and coated in the mayonnaise / yogurt. Season to taste before topping the dish with the walnuts and grated parmesan. All this talk of picnics and days at the beach seems a lot like wishful thinking right now but we’ve got to stay positive! My sister is currently on holiday in Cornwall and they seem to have pitched up in the middle of a river – unintentional of course. I hope it clears up for their sake. Are you enjoying a traditional British Summer where you are? Do you give in and dig into comforting pies and stews when the weather turns or power through with summery salads and soups? If you’ve enjoyed this recipe, why not try one of these delicious pasta salads from other UK Food Bloggers? My pleasure Andrea. Glad you like it! Love the look of this. I’ve recently made some Sicilian pasta with cauliflower and raisins – would have never previously thought of putting raisins in pasta but it really works! This looks delish – will try sometime soon! Thanks Kate! Now I think about it I’d never had raisins and pasta either until this dish! 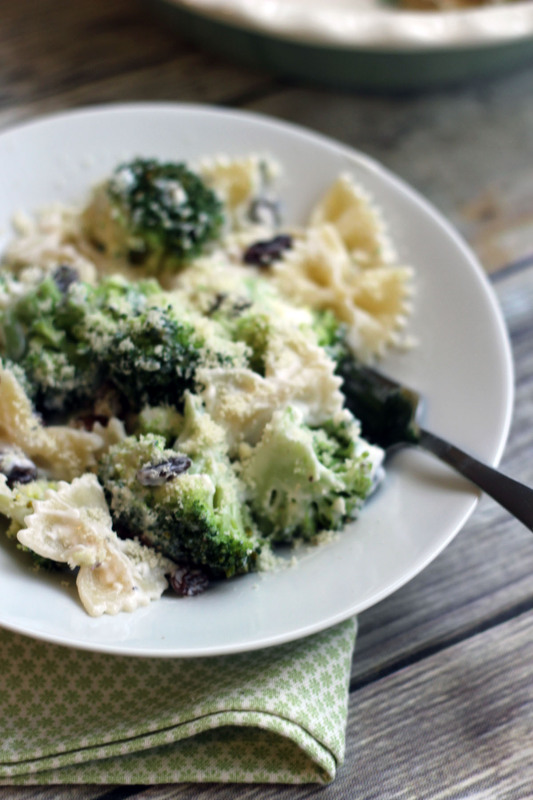 Broccoli and raisins are a great combo! Thanks Elizabeth! There is something very comforting about pasta salad isn’t there! Hopefully this is not only delicious and filling but also good for a balanced diet.